The Rawlins Downtown Development Authority/Main Street program received a One to Watch Award at this year’s National Main Streets Conference on May 18 in Detroit, Michigan. The award recognizes exceptional communities working on very innovative projects, and that are poised on the cusp of major transformation. They exemplify the idea that any great Main Street is an ever-evolving work in progress and offer inspiration for other Main Street programs. It is the first time the award has been given. Middlesborough, Kentucky also received the One to Watch Award. In March, Rawlins was named one of 10 semifinalists for the Great American Main Street Award (GAMSA), a coveted award that recognizes exceptional Main Street communities with successes that serve as a model for comprehensive, preservation-based commercial district revitalization. Rawlins’ nomination as a semifinalist for the GAMSA marked the first time a Wyoming Main Street community has been selected. No community from the Rocky Mountain Region has previously won the GAMSA. According to Thayer, over the past several years Rawlins has seen many successes including: A drop in the downtown’s building vacancy rate from 45 percent to 10 percent; nearly 25,000 volunteer hours in the program since its inception in 2006, which equals an in-kind contribution to the program of $523,807; and 55 private and public rehabilitation projects completed. The total dollars reinvested in the downtown district since 2008 is about $7.2 million; and for every dollar the Rawlins DDA/Main Street incurred in costs there was a return of $9.56 returned to the downtown district. For more information about the Wyoming Main Street program, contact Mary Randolph at 307.777.6430 or mary.randolph@wyo.gov. For information about the Rawlins DDA/Main Street program contact Pam Thayer at 307.328.2099 or rawlinsmainstreeted@rawlins-wyoming.com. The Wyoming Main Street program was established by the Wyoming Legislature in 2004. The National Main Street Center, a subsidiary of the National Trust for Historic Preservation, emphasizes a four-point approach to revitalization: economic restructuring, design, organization and promotion. The mission of the Business Council is to facilitate the economic growth of Wyoming. The Business Council, a state government agency, concentrates its efforts on providing assistance for existing Wyoming companies and start-ups, helping communities meet their development and diversification needs, and recruiting new firms and industries targeted to complement the state’s assets. For more information, please visit www.wyomingbusiness.org. Laramie Main Street Announces Laramie Mural Project Naming Competition! Click the image at left for tickets, info, schedule & more for our Food & Photo Festival, May 30 & 31 in Laramie! A group of painters will use the backdrop of the National Elk Refuge as artistic inspiration on Tuesday, May 13, giving visitors an opportunity to watch and ask questions as the artists create their works. The artists are part of the Teton Plein Air Painters, a group of artists who meet once a week from May – October in the Teton environs. Starting with two people during the summer of 2012, the group now has a communication list of over seventy. Typically, three to ten people are onsite to paint, referencing the landscape for motifs. Art mediums include oil, acrylic, watercolor, and pen and ink. The group will spread out in the area of the visitor center, located at 532 N. Cache Street in Jackson. Weather permitting, likely locations will include the visitor center lawn, the covered upper deck of the facility, and the remote viewing deck across the lawn next to the wetlands area. Current visitor center hours are from 9:00 am – 5:00 pm, but visitors are welcome to stroll through the grounds after hours to enjoy the art session. En plein air is a French expression which means “in the open air” and is used to describe painting done in an outdoor setting. The artists paint natural light, using color to define form. Depending on the light and weather, plein air paintings are generally done in one session. Artists may add final touches to their work once back in the studio. For additional information on the Teton Plein Air Painters and Tuesday’s session, contact Bobbi Miller, Facilitator, at 307 / 543 2910. MOOSE, WY —For the past 39 years, artisans from diverse American Indian tribes have demonstrated their traditional and contemporary art forms in Grand Teton National Park. This annual program provides visitors a chance to gain greater appreciation and understanding of Indian cultures that are still alive and active today. Participating artists demonstrate and share the cultural traditions of their tribes through art forms such as painting, weaving, pottery, beadwork, and musical instruments. Guest artists exhibit daily from 9 a.m. to 7 p.m. at the Colter Bay Visitor Center. Artists also offer their finished items for purchase. Join the Laramie Main Street Alliance in celebrating the fourth year of the Laramie Mural Project! Now through the end of June, take a selfie with your favorite mural and post it to Facebook, Twitter or Instagram using hashtag #laramiemural for a chance to win mural themed merchandise! Then, visit the artists painting behind Altitude (starting next week) and suggest a name for our new mural! You can post your suggestions to our Facebook page, “Downtown Laramie” or email them to downtownlaramie@gmail.com. Suggestions will be compiled by the artists and the top three will be posted the first week of June with voting opened up to the public. The name will be announced at our dedication party for the mural on Friday, June 13th from 5 to 7 p.m. behind Altitude Chophouse, 320 S. 2nd Street. For more information about the Laramie Mural Project, visit: www.laramiemuralproject.org or call 307-760-3355. Wildlife managers are preparing for two upcoming hunting seasons on the National Elk Refuge. Hunting programs on the Refuge are used as a management tool to achieve optimum herd size as determined through a cooperative effort between the National Elk Refuge, Grand Teton National Park, and Wyoming Game & Fish Department managers. The 2013 bison hunting season on the National Elk Refuge will begin on August 15 and run through January 12, 2014. Bison hunting licenses are issued by the Wyoming Game & Fish Department. A Refuge–specific bison permit is required and is provided with the State license. Individuals who have not already applied and been selected for the 2013 season are not eligible to hunt bison this season. The Refuge bison hunting season will be comprised of 12 hunt periods of varying length, with a number of week-long breaks of non-disturbance incorporated into the season. This is intended to increase the success rate for hunters since bison, along with other animals, may learn to avoid an area with continued hunting pressure. Wildlife managers are using the hunt period structure as a tool to achieve herd objectives. The 2013 Refuge elk hunting season will run from October 12 through December 15 and will consist of 10 consecutive hunt periods. Persons interested in hunting elk may begin applying for Refuge–specific permits beginning Wednesday, August 14. Applications for elk permits must be submitted electronically by September 25 to be entered into a computerized random draw. The results of the drawing will be posted on the application web site by September 26. Application for National Elk Refuge elk hunting permits is done in cooperation with the Wyoming Game & Fish Private Lands Public Wildlife Access program. Hunters may initially apply for only one hunt period per hunt unit and must already have a valid Wyoming elk license to enter the electronic drawing. Elk hunters attempting to fill two valid licenses on the Refuge during the same hunt period do not need to apply for two Refuge permits. Bison and elk hunting information, including general information, application procedures, regulations, maps, weapons restrictions, and access can be found on the National Elk Refuge’s web page at www.fws.gov/refuge/national_elk_refuge. Printed copies of Refuge regulations can be picked up in Jackson at the Jackson Hole & Greater Yellowstone Visitor Center (532 N. Cache Street), Wyoming Game & Fish Department (420 N. Cache Street), or the National Elk Refuge Administrative Offices (625 E. Broadway Avenue). Printable versions (PDF) of the regulations and maps are available on the web site. Persons traveling on Refuge roads, including Curtis Canyon and Flat Creek roads, are encouraged to familiarize themselves with hunt boundaries and be aware that hunters may be in the area. Thanks to over 160 backers, Laramie Main Street reached their fundraising goal for the Laramie Mural Project before their deadline of July 21st and then, the donations kept coming in! When all was said and done, they raised just short of $20,000!!! They have already begun to use those donations to expand the Laramie Mural Project. Check out the new murals going up downtown at 3rd and Kearney, behind the Big Dipper at 111 Ivinson and in the alley behind the Curiosity Shoppe. Be sure to mark your calendar for an event like you’ve never seen in downtown Laramie! Move in Weekend, Aug. 23 – 25 they will be hosting the Downtown Mash Up featuring the Gem City Car Classic and Laramie Fiber Arts Festival. This is a joint event between the University of Wyoming Athletic Dept., Laramie Main Street, DLBA and the fiber art galleries downtown. Ever wondered what was above your favorite downtown businesses? Now is your chance to find out! Join Laramie Main Street on Friday, August 16 from 3 to 7 p.m. for a self-guided tour of the lofts and apartments downtown. Everything from cozy one bedroom units to expansive family lofts. Tickets are $10 in advance, $15 the day of and can be purchased with cash, check or credit card from the Main Street office at 207 Grand Ave. or by calling 307-760-3355. The Upstairs/Downtown tour is designed to promote residential space and living in the historic district as well as raise funds for the Laramie Main Street Alliance. Stop by the Roundhouse Festival this weekend in Evanston at the Roundhouse to purchase your 2013 HO collectors car. These will be available at the this weekends Roundhouse Festival. This year’s car commemorates the Lincoln Highway’s 100th anniversary! 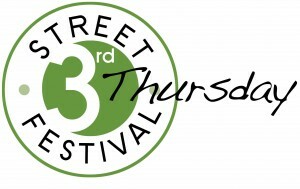 The next 3rd Thursday Festival will be held August 15! Join in for all the fun, food and music! Check out the next round of great art exhibits at SAGE Community Art Center! If you’re planning on attending the National High School Rodeo Finals, be sure and check out theirLodging page for a full list of area hotels, motels and campgrounds. Visit the complex’s website for a schedule of events! Here we go, Cheyenne — CFD is HERE!!! This annual event, the Daddy of ‘Em All, brings visitors from throughout the globe to the state’s capitol. Visit their website for all the details — schedule, events, concerts, carnivals, pancake breakfasts, parades, and of course…RODEO!!!!! Thanks to our official photographer, Don Christner of Cheyenne & our friend Cliff Cox, who will be providing us with all sorts of great images! The Evanston Main Street’s Brew Fest is a huge annual event! Enjoy brew from local Suds Bros., New Belgium, Blue Moon and many more! July 20, 1-5 PM — with food, music and fun added in! Depot Square, Downtown Evanston. Music, food & vendors will be open on Main Street from 1-10 PM. Tickets $25 in advance, $30 at the gate — click here for more info! Lots of western fun to be had at this great annual event! This year, Longmire fans rejoice! They’ll be incorporating a tip of the hat to WY author Craig Johnson & will feature autographed Longmire Books, bumper stickers & a Red Pony Saloon ball cap or 2 in our NDOC celebration on July 27th. Thank you to Julie @ Two Ocean Books for making all the arrangements! Visit the National Day of the Cowboy Dubois website for more info on this event! Starting Friday July 26th and continuing through Sunday July 28th, Casper Air Modelers are excited to announce the 2013 Annual Fun Fly and RC Aircraft Fly In. The fly in weekend will provide a great opportunity for air modelers around the region to showcase their models, machines and skills. All ages are welcomed to attend and view model aircraft, flying demonstrations and talk with experts about radio controlled aircraft. Their will be aircraft of all types, shapes and sizes such as large scale airplanes up to 10′ wing spans, micro electric RC aircraft, electric and gas operated helicopters and everything in between. RC pilots are welcomed to attend and fly but an AMA membership is required to conform to insurance regulations. The Casper Air Modelers facility is located just north of the Casper Events Center and just west of the motocross track north of Casper. Models will be on display and flying will be done weather permitting from 8am to 8pm Friday, Saturday and Sunday.Visit their website for more information! Over the last few weeks the Laramie Mural Project has seen the Laramie community come together in support of local public art. From a tiny seed and a hopeful vision, this project has grown into something we can all be proud of! Now that in the home stretch, they are continuing to share their enthusiasm for this project. They’re aiming to meet their goal of $15,000 by July 21 — if they are not able to reach our goal of $15,000 by July 21, we will not receive any of the pledges and this will be the last summer for the Laramie Mural Project (insert sad face here). Contact the Laramie Main Street Alliance at 307-760-3355 and visit the project’s website for more information and/or to make a pledge — they are soooooooooooooo close! 9:30am-8pm in Lander City Park. Spend the day in Lander’s beautiful city park enjoying great art, live music, fun activities, and delicious food and drink! This event offers 30 booths of high quality original artwork from local and regional artists. Artwork includes jewelry, metal, woodworking, painting, photography, leather work, ceramics, fiber and paper arts. There will be artist demonstrations, art activities and face painting from the Lander Art Center and an activity from the Lander Children’s Museum. All proceeds support the Lander Art Center in putting on this event. The Park will be celebrating 75 years since it was proclaimed a National Monument by President Franklin Roosevelt on July 16, 1938. The inclusion of Fort Laramie in the National Park System was the culmination of years of hard work by interested local citizens who recognized the hugely significant role that Fort Laramie played in the shaping of the United States of America. Park Superintendent Mitzi Frank pointed out that it is impossible to pick up a book about history of 19th century America and fail to find the name “Fort Laramie” prominently featured. Visit the park on Saturday, July 20 to celebrate this momentous anniversary! Click here for more information on this historic Wyoming treasure.